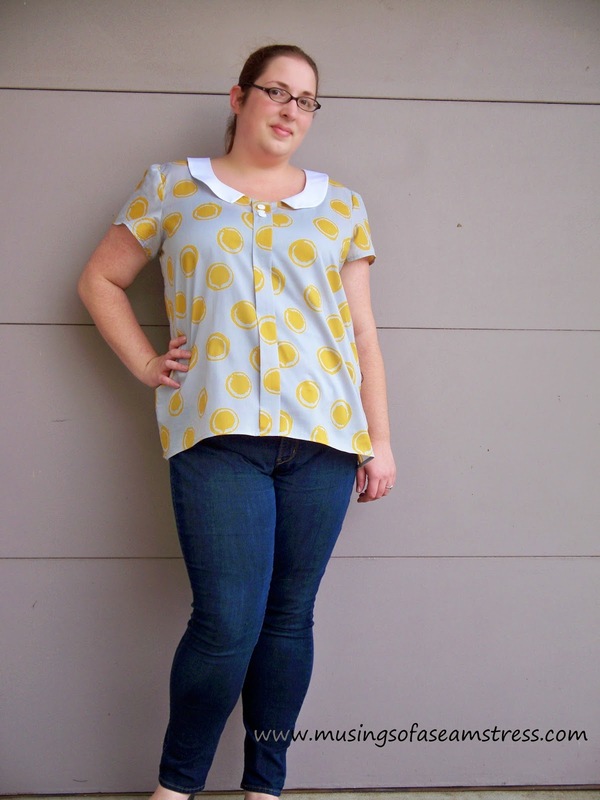 Fabric Mart Fabricistas: Fashion Challenge #1 - Scout Tee - What They Made!! Fashion Challenge #1 - Scout Tee - What They Made!! Words cannot express how in awe I am by what these ladies came up with! I had NO idea what to expect and they have exceeded my expectations!! Great job to ALL of you. 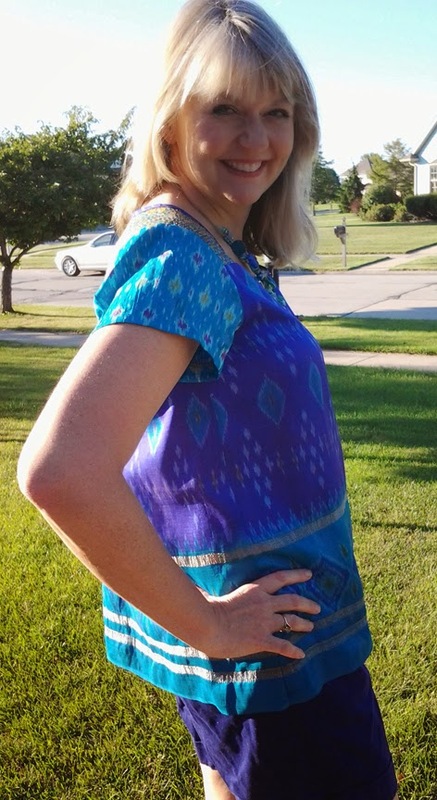 This week's challenge will be judged my myself (Julie), Shannon from Shanni Loves and winner of the the 2013 Fabricista Fashion Challenge, and Jen, owner and designer of Grainline Studio! I'm stoked to have both of these fabulous ladies help me in the judging process. Jen is a surprise judge to the contestants!! Along with the criteria below, we will be sharing with each of the contestants their strengths in the garment as well as where we feel they can improve. 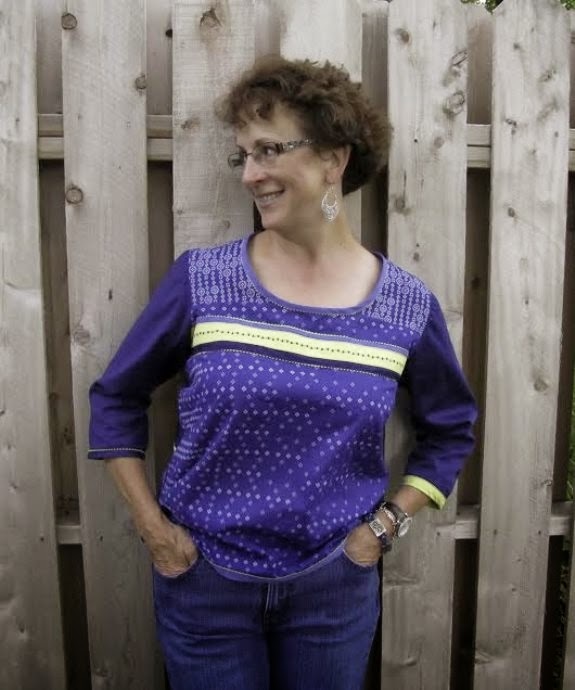 Winner of this challenge will receive TWO FREE patterns from Grainline Studio. Refer back to the original challenge post for what we're judging the contestants on. I live in a university town with many international students. When they finish their degrees, sometimes they have too much stuff to take back to their home country. So, they give their things to us lucky locals. Last Spring, my daughter was given a big bag of pure silk sari scrap from an artist. When I got the Scout Tee challenge, I remembered the sari scrap bag and decided to take a look inside. They were so pretty! Saris have such beautiful designs and rich colors. I picked out a few pieces that I thought looked good together. I wanted to use a border print at the bottom of the shirt. I lengthened the shirt pieces a few inches to show as much of the border as I could. 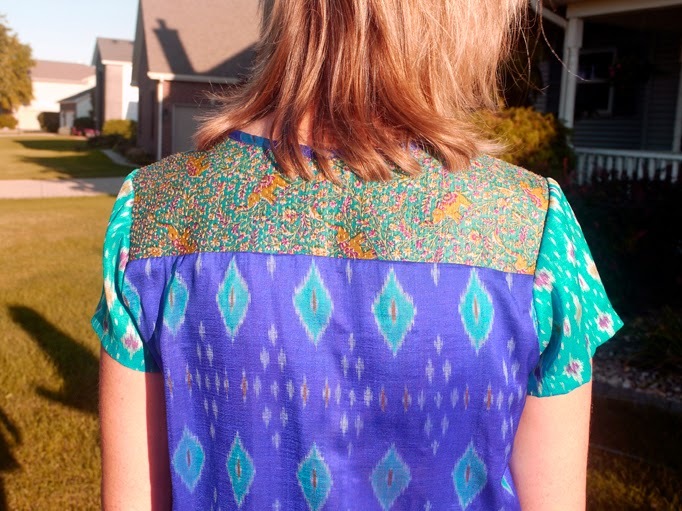 I also incorporated an embroidered elephant fabric by drafting front and back yoke pieces and I used a third smaller ikat print fabric for the sleeves. I widened the bias binding strip and used it on the right side of the shirt so that it would tie the yokes and main front pieces together visually. I imagine the path that the saris must have traveled-- from India to Illinois, through multiple owners - from sari wearer, to artist, to me. It looks equally good with white pants for a dressy outfit or with shorts for a summer day. I love my new t-shirt! The Scout Tee pattern is really well drafted and I'm sure that I'll use it as a base for many future projects. When Julie sent us this week's challenge, I was excited. I love t-shirts! But the Scout Woven Tee is a lot different than the form-fitting knit t-shirts I usually wear. Because the silhouette is rather boxy, I decided to make my version as feminine as possible without changing the overall design too much. I selected a lightweight cotton voile from my stash that had the perfect drape for this pattern. 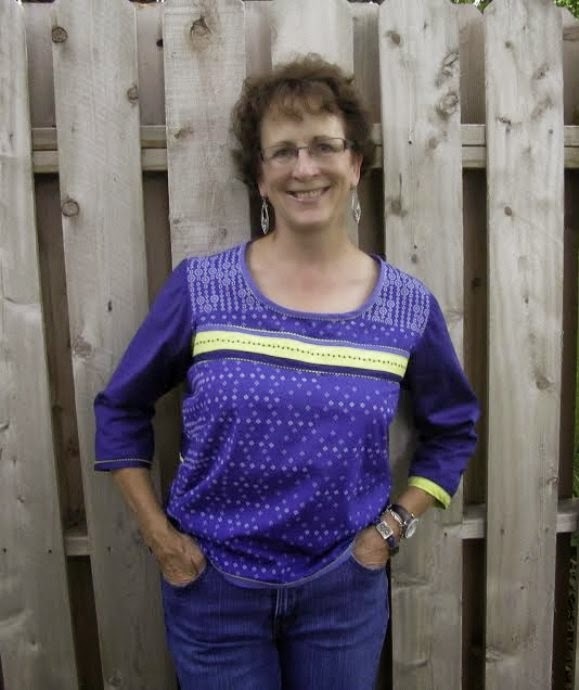 On the front and back bodice, I sewed on lace hem tape to create a vertical stripe. On the front, I sewed two sets of three pintucks, and I carried over that idea to the sleeves as well. While redrafting the sleeve to include pintucks, I added height to the sleeve cap so that I could incorporate sweet, pretty gathers into the sleeve head. 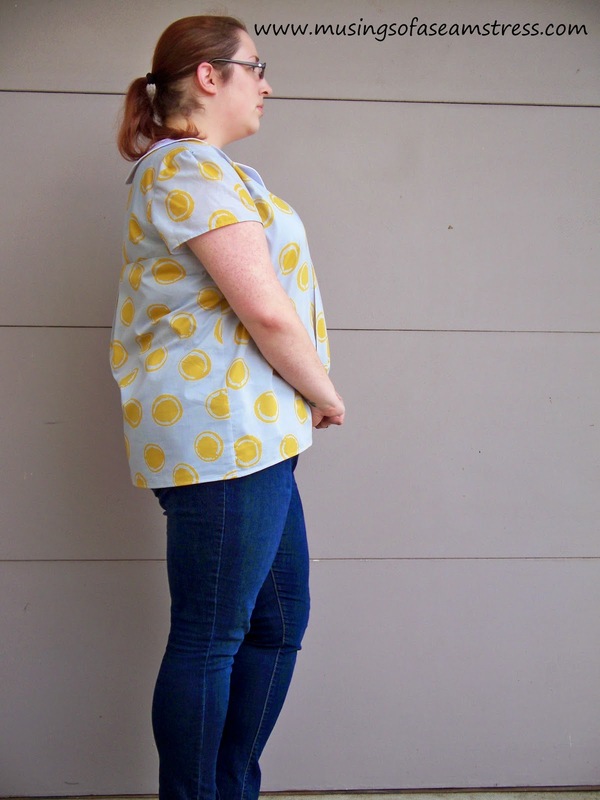 I lengthened the front and back into a high-low shirttail hem with side splits. Finally, to make sure this t-shirt was completely “me”, I used bright pink bias tape on the neckline and to hem the sleeves. I love pink, and rather than hide the bias tape facing inside the garment, I turned it outside so the whole world could enjoy it! I know from experience that voile frays a LOT, so the seam allowances on the side seams were turned under and topstitched on both sides of the seam. The shoulder, sleeve and armscye seams are all French seams. In the end, I have a beautiful, feminine top that fits perfectly into my wardrobe, which is predominately grey, pink and navy. After sewing all those pintucks with a regular sewing machine foot, I think I’ll be treating myself to a quarter-inch foot with a guide! I love tees, but I am not much of a tee/jeans girl, and have always preferred dresses and tunics to plain old tees. But I wanted to keep the tee in "Scout tee," while really doing something to change it. Hmm, I thought, what can I do? 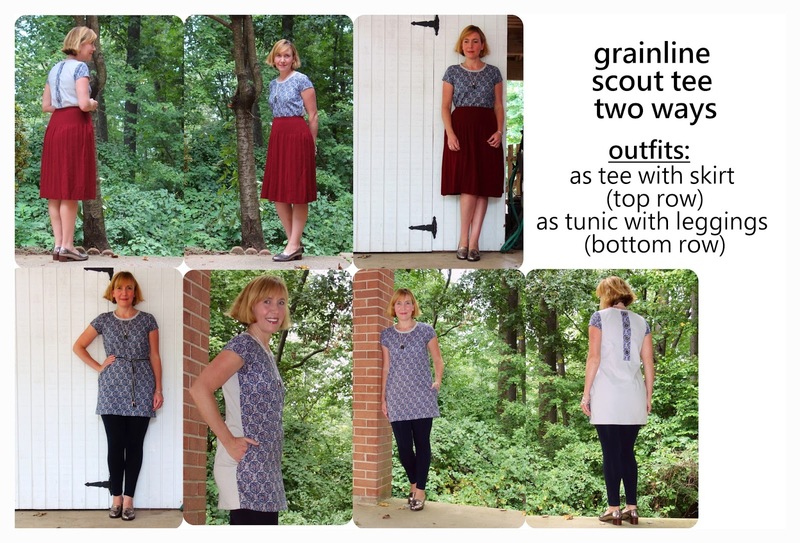 Well, it struck me that if I made a tunic from lighter weight fabrics I could tuck a tunic into a skirt and have a tee! 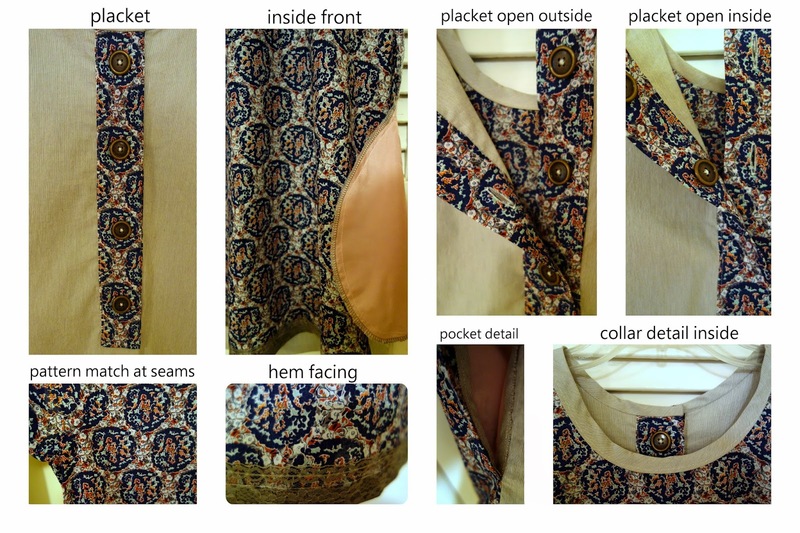 (I have done this before with similar fabric tunics in the past.) 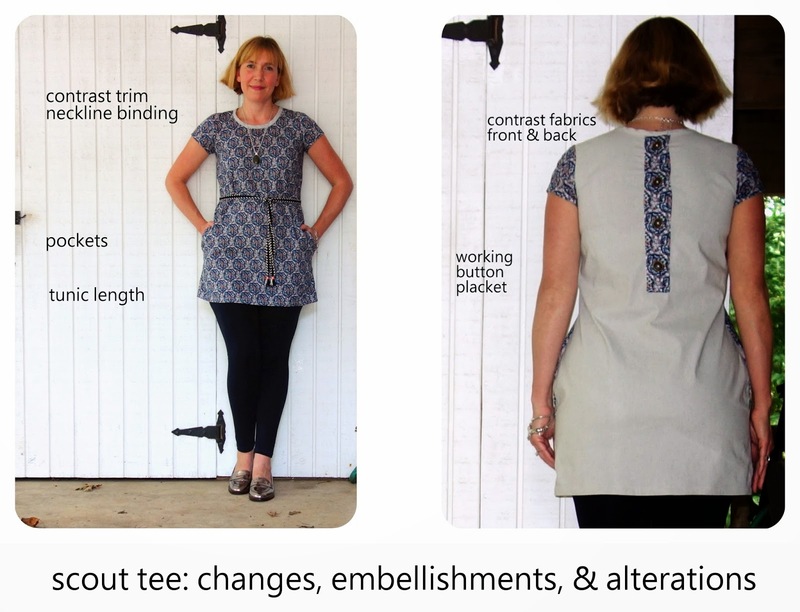 Well, just lengthening the tee to a tunic isn't enough to change it, so I thought, what else could I do? Aha, I thought, pockets! Pockets are awesome! I grabbed a pocket pattern from a coat pattern I own and taking a dress with a similar line to the tunic pattern, found where those pockets hit and marked that point on the new tunic pattern. But being me, I knew pockets wouldn't be enough, so I added contrasting materials. The front a beautiful graphic printed lawn from a Julie's Picks last spring in navy/grey/orange/rust/light blue, and the back from a stretchy cotton pinstripe grey/white fabric (the pinstripe is not visible in pictures). The two work nicely together! 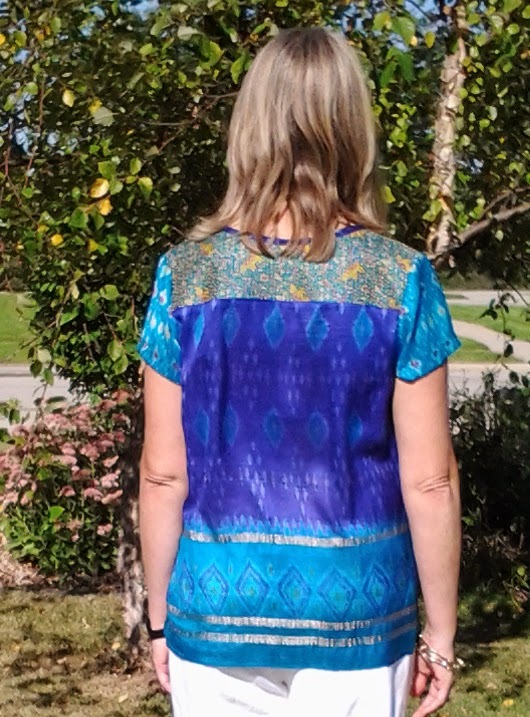 As a tunic, I will wear it over leggings or skinny pants. I can wear it on its own, of course, but I can also add a belt/tie to cinch in the waist if need be. I also think this would be cute under a long cardigan and with boots in the winter. As a tucked-in-blouse, I really can onlu wear it with skirts since the length is too long to be tucked into pants. But, it really does look like a proper tee/blouse when tucked into the skirt. And since there are so many colors in the lawn, I really do have a lot of options for what color skirt to choose. My entire outfit was inspired by Alexander McQueen. The moment I saw this outfit, I knew I needed it in my life! Besides, I already had the fabric of which I picked up last weekend for $2.97 a yard. The fabric did not have a type label. But is a woven knit with zero stretch much like a textured suiting material, definitely polyester or rayon. You can find the outfit (Here). You see the price??? OOOUUCH! The great thing about t-shirt patterns is you can basically make ANYTHING using the pattern as a base. Instead of doing the neck binding, I opted to create facing and understitch it. I created a video to show you the adjustments made to accomplish this look (HERE.) My pants are M6930 drafted into pants. You already know that is one of my staples! Scout was a real challenge for me, for sure! It was a bit of a struggle to make a woven t-shirt without a dart flattering on my bust. But I was determined to keep with the spirit of Scout by sticking with the a woven fabric and fitted shoulder and fuller torso. I adjusted my top to my form by adding a full bust adjustment (which I was able to absorb into the upper front side panel), I took the sides in at the waist a total of 3" and added a seam at the center back to shape a bit there as well. 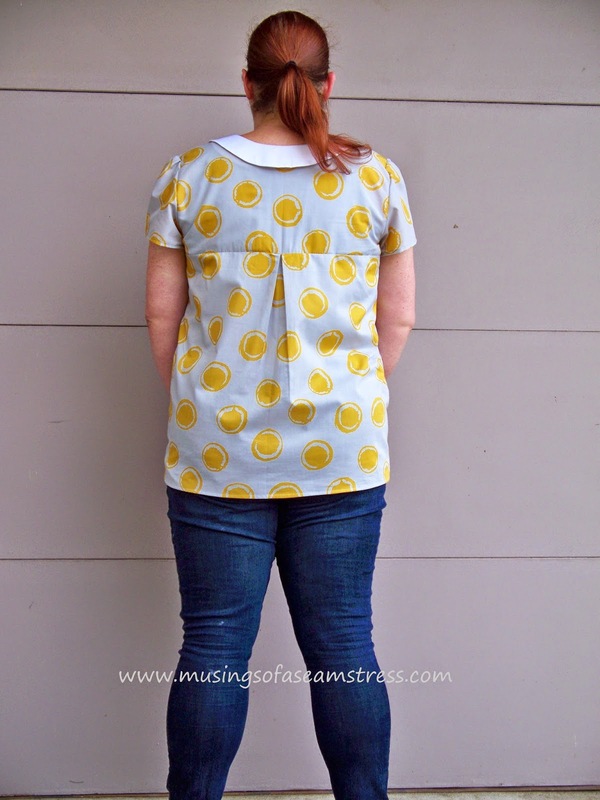 After several sketches, I decided to make a color-blocked top using curved style lines with a few extra whistles, such as tulip sleeves, peek-a-boo eyelet and a fun, curved center back hem. I was a little inspired by the TV show I've been watching (Big Love), and a little inspired by folksy eclectic/mixed print looks I've seen in current fashion. I'm looking forward to including this top in my early Fall look for this year: it will be a great top for hanging out to going out. I knew right away that I wanted an exposed zipper detail. This summer I saw this silk top that had cut on sleeves and was very simple but had an exposed zipper. I've been thinking non-stop about a tee with an exposed zipper! From there, I played around with doing a contrast yoke or a lace yoke but decided those options may be a bit too predictable. I started thinking about a lace overlay and from there decided to do this contrast overlay. I think that black and cream/ivory is such a classic combination, so I knew this top would work with many items that I already have. I got REALLY excited to pair it with my newly sewn red pants. I decided to have the overlay sit higher at center front and added just a little bit of swing so it would be more "swishy" than the top. Because I was going to attach the overlay like a lining; I drafted facings for the back, giving me a nice, clean neckline. 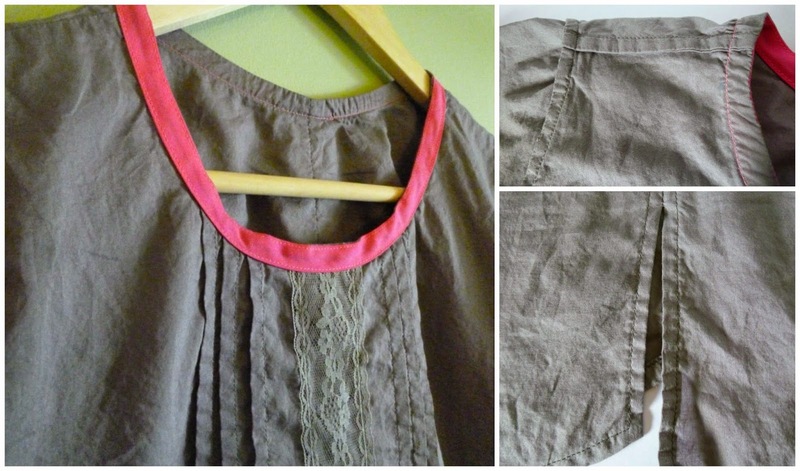 The overlay was finished with a rolled hem on my machine; the top and sleeves with a narrow hem. The black is a (lovely!) rayon challis and the cream is a poly crepe. Both of these have been in the stash for well over a year. It's always fun to use stash fabrics up! For this top, I first took the line art and started sketching possible modifications to it. I had about 4 or 5 different ideas making it hard to pick just one. I will be going back and making some of the other versions later, but for now this is the one that seemed like the most fun to make. I added a faux pleat to the front with three white buttons to go with the white Peter Pan collar. I also split the back to make a yoke and added a box pleat to it. The sleeve is the only pattern piece that I left untouched. It is made of a lightweight woven cotton that I got in a mystery bundle from Fabric Mart last year. 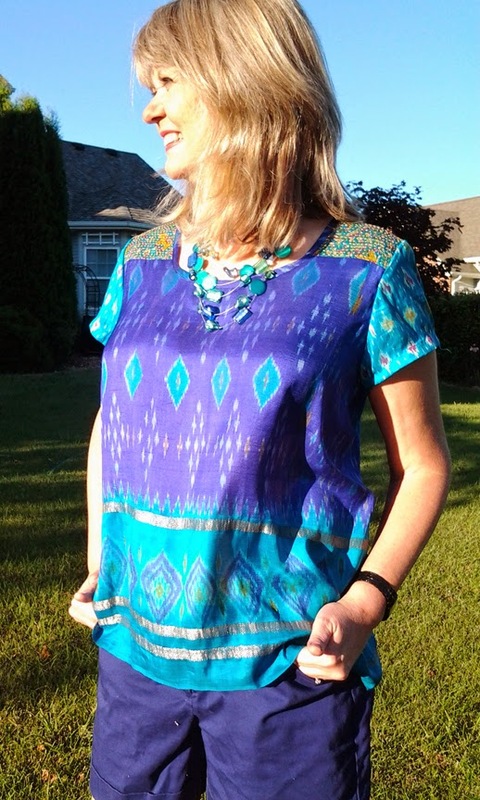 My Scout Woven Tee started from 2 muslins and an assortment of thrift store garments since I was unable to find what I wanted to use from my stash or locally purchase. Embellishments were key to this top with various sized matching rick rack and bias cut pieces that included some embroidery using the decorative stitches on my machine. Details of the front including the bias binding neckband which was folded to the right side to highlight the color, texture of the fabric and the trim. I included the chartreuse rick rack peeking out of the seam line. The back was originally going to include functional buttons, but as I progressed, I thought the overall design would become too busy. 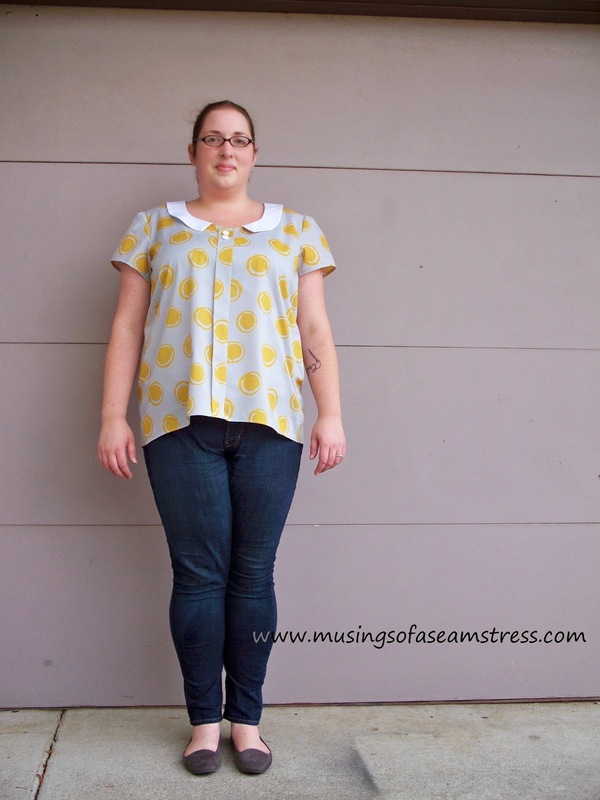 I had to use the button band from the dark blue top on one of the sleeves. Notice the rick rack that is enclosed in the seam? 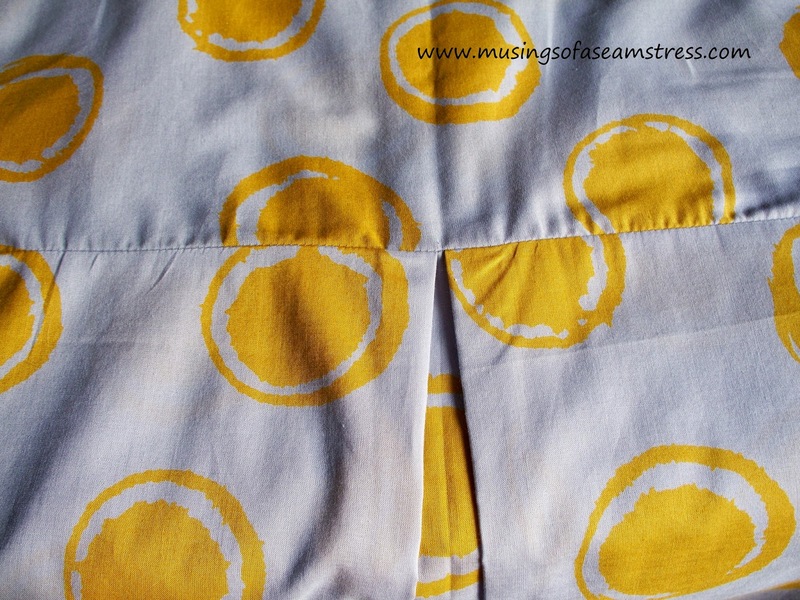 It adds just the right amount of detail to make this seam and buttons pop! I love the overall fit and casualness of the top and fabric combination! Wow, you are right, these sewists knocked this out of the ball park from the get go! Hard to vote for just one!!! Oh my gosh! Nice work everyone!!! Very creative all! Bravo! I am inspired and look forward to attempting many of these looks! This is beautiful! 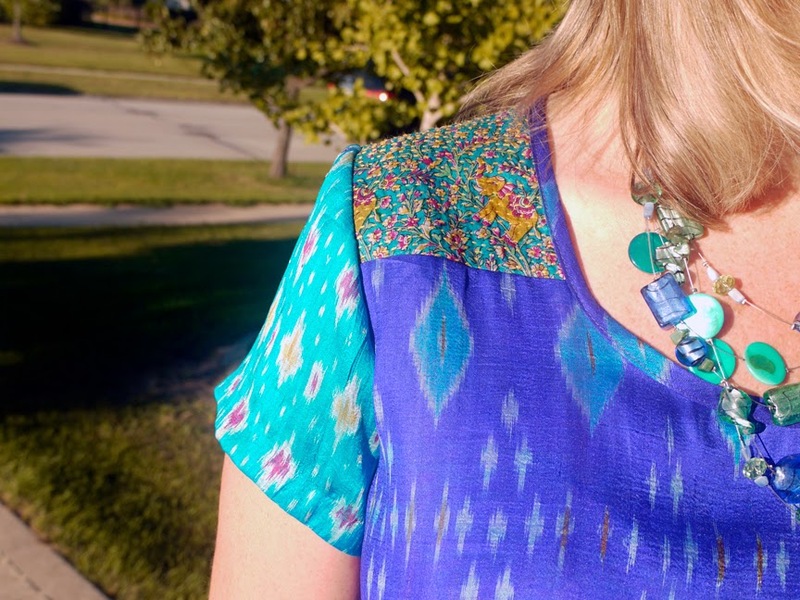 I love the creative use of thrift store garments to make this vibrant, classy top! I am completely in awe of all of these--so much creativity and skill! You are all light years beyond me. I am also very impressed that everyone did something different to the tee, and I bet you didn't compare notes beforehand! Amazing variety of looks from this same pattern. Each one of you did did excellent work on these and the creativity shown is beautiful! Beautiful versions! And how are you supposed to vote? Hi Justine, Voting for this challenge is closed.